In 2006, Kieran Flynn wrote an article which reported that the experience of Muslims in Ireland has been a largely positive one. In addition to Flynn, Oliver Scharbrodt, currently a lecturer at University College Cork, has produced several articles on Irish Muslims, one of which looked at a particular Shi’a Muslim community in Dublin of largely Pakistani descent. Scharbrodt concluded that this group practices a “moderate Islam” and have integrated themselves into their surrounding neighborhoods. My own PhD research into the experiences of first- and second-generation Pakistani men in Dublin also supports the claim that Muslims have largely integrated into Ireland. For the last few years I have met and interviewed Pakistanis of all kinds of backgrounds to document how they are negotiating their cultural, religious, and national identities. One of my participants, who was born and raised in Dublin, can speak the Irish language fluently and attended one of Dublin’s major universities. Several of my immigrant participants have actively taken steps to ensure that they are integrating and not isolating themselves from other communities. Some of these immigrant participants have attended mass at churches with their Catholic colleagues and visited pubs with their friends to watch football or rugby matches. In one of my interviews, a second-generation Pakistani man, who claims to be a Sufi Muslim, told me about how he admires Irish mysticism, as it closely resembles his own spiritual beliefs as a Muslim. During our interview, he compared Saint Patrick’s spiritual power in uplifting the hearts and minds of the Irish, who were at the time without God, to the Prophet Muhammad, who also enlightened his people – the Arabs – in a similar way. During a celebration of the Prophet Muhammad’s birthday in March 2013, I attended a zhikr, an Islamic devotional act and form of prayer usually conducted by Sufis. In the middle of the prayer circle was a bright light, and over that bright light was an Irish flag that lit up the room in a faint green and orange color. The combination of the light and the Irish flag was, for me, a symbol of the synthesis between Irish pride and Muslim piety. Next week I will be traveling to Blanchardstown to meet my friend Sheikh Muhammad Umar al-Qadri, who also encourages Irish Muslims to integrate into Irish society. 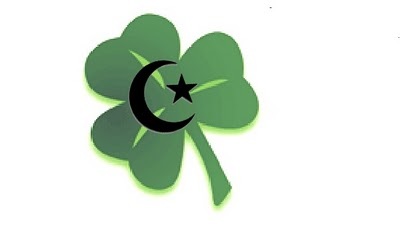 We are working on some ideas on ways to improve relations between Muslims and non-Muslims in Ireland. The disturbing and threatening letter sent to Irish Muslims is full of baseless claims that have little support in academic literature. Academic studies, and not random letters based in ignorance and racism, should set the standard for the discourse surrounding Islam and Muslims in Ireland. Next Post Turning Hagia Sophia into a mosque, a church, or both?